Prokopievsky plant "Electroprom" (HC "SDS-Mash") in February mastered production and produced the first batch of wheel stops for car carriers, following the first order. On the second line. The order for the new configuration of wheeled emphasis entered the "Electroprom" from "Altaivagon." Both companies are part of the holding company "SDS-Mash." 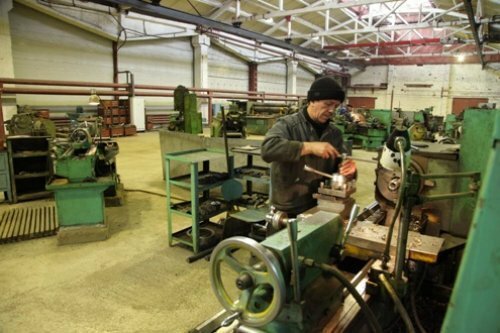 Plans developed Altai machine builders, and prokopchanam already had to make a new plant for production. The focus wheel is a sub-assembly and is designed to attach car in the car during transportation. "In order to release a new product, it was necessary to make special tooling equipment — says chief technology" Elektroproma "Gennady Vdovkin. — So far we have produced close range, but now its design has changed dramatically. We have organized the training of experienced professionals and can now confidently say that the production of new stops have mastered. " Who’s new production runs 3 teams, which consist of experts of the enterprise who worked previously on other sites. Each team of 4 people. "In February 1000 we made the stops, which means furnish the necessary details 25 car carriers — says Gennady Vdovkin. — "Altaivagon" made products flawlessly. As of March, we have an order for 2,000 units. "